Retail is going through a significant shift as technology transforms businesses across the country. Some changes are obvious, such as the use of apps for shopping, while others are subtler – like the development of dark stores. 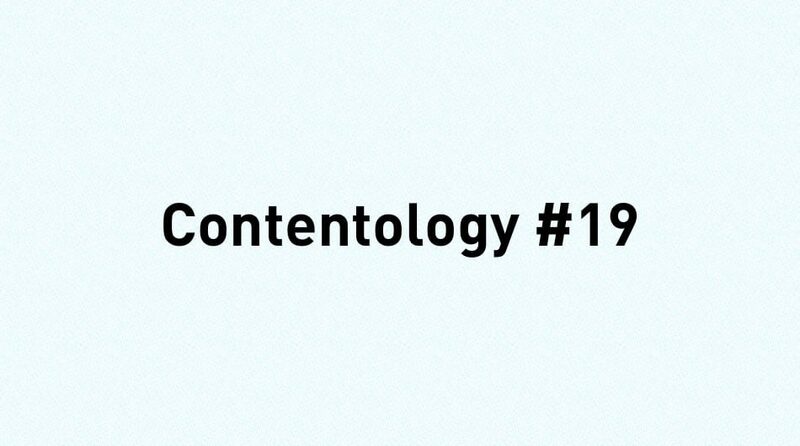 In Contentology #19, we look at how retail is adapting to the digital landscape, highlighting interesting developments and useful insights. So forget your fruit and veg, and grab a coffee – the devil is in the data. Figures from ONS suggest encouraging growth in online retail sales (as a percentage of total sales), from approximately 2.5% in 2006 to around 12% in 2016 in the UK. This has resulted in major retailers making significant investments in their customer journey, from websites to fulfilment, leading to 69% of adults aged 55 to 64 years old making a purchase online. This is significant when you think about how Generation Z and Millennials tend to be targeted more frequently with their typically high adoption rates in technology. The penetration of smartphones is as high as 81% for 16–24-year-olds, taken from a 2015 report by OfCom. 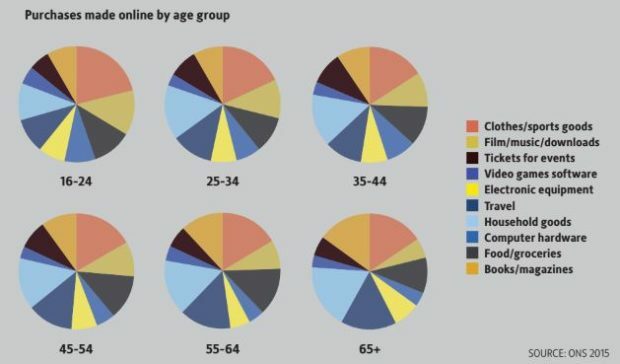 In fact, only 5% of 55–64-year-olds use devices other than a computer to go online, indicating how well retailers have done to make the online shopping experience versatile for a contrasting range of age groups, who all use different devices for their weekly shop. However, currently customers do not spend a lot of their online budget on groceries. As can be seen in the pie charts below, most ecommerce sales tend to be products with longer lifespans, such as household goods, clothes/sports goods, film/music/downloads and books/magazines. This is consistent across all age groups, which shouldn’t come as much of a surprise, as seen by the success of Amazon and the introduction of vinyl at Sainsbury’s. As a result, it has become a case of merging the online and instore experience through omnichannel, to make the best of both worlds. Further data from ONS suggests a figure as high as 69% of UK women prefer to shop in person, and just over 52% of men. Data from L2Inc agrees with this, suggesting that the biggest factor in deciding to shop instore rather than online has been the ability to see, touch and try merchandise, alongside not having to wait for a delivery, and the ability to return goods and check the suitability of products. This convergence of e-commerce and instore has led to the popularity of Click and Collect. There is no need for customers to stay at home and wait for the delivery of their food, and they’re also able to avoid queues and instore crowds. Click and Collect also allows retailers to upsell. According to Retail Assist, shoppers spend an additional £27 per trip on purchasing more products. Another advantage to Click and Collect is that it reduces fulfilment costs. ‘The average cost of sending a delivery through a third-party carrier’s network… is about £3–£3.50. That’s fine for higher-value items, but it starts to get tricky for shipments of individual books or CDs, for example,’ says Stuart Higgins, partner at LCP Consulting, a management consultancy specialising in supply chain management. Stores that have embraced Click & Collect include Selfridges, Tesco, Asda, Boots and John Lewis. John Lewis also allows customers to pick up orders from their sister company, Waitrose, resulting in 300 more collection points throughout the UK. In the USA, Wal-Mart and Target have also been expanding their Click and Collect capabilities, both trying to capitalise on the locality of their stores as distribution centres. Back in the UK, supermarket chains such as Tesco are building entire warehouses to hold food – otherwise known as dark stores – for online customers. When online shopping started, supermarket staff were sent around the stores to collect online orders, but this method soon became unsustainable as orders increased. The new system will eventually become extremely significant for retailers, especially in cities where delivery costs can be reduced to a minimum. Startups are also beginning to partner with multiple organisations such as Instacart. A key component of customer acquisition will therefore become who can deliver the most for less, and that’s from both a retailer and customer perspective. This can also be seen by Sainsbury’s launch of Chop Chop, which can arrange one-hour deliveries exclusively to London. So you may be wondering about the point of all this in Contentology. Brands will probably be wondering, too, because without a consistent content strategy across both online and offline channels, fundamental transformations in their businesses would not make sense to their customers. Content creates cohesion, it underlines a message and reinforces an identity. It is the ongoing narrative that drives customer advocacy and is ultimately worth more in the digital landscape than ever before. Content also increases a brand’s exposure ‘beyond the shop walls’, instead of having to rely on in-store footfall. With all this in mind, it is no surprise that as we move closer to the realities of omnichannel, content will be the guide that blurs the lines between online and offline shopping experiences. Independent star Grimes is interviewed for her front cover shoot for ASOS magazine. The brand cleverly integrates the clothes into its ecommerce strategy, increasing the potential ROI of the content. The ASOS YouTube channel has been in development for over five years now, leading to 73,173 subscribers and 23,199,057 views – proving that video marketing is about long-term investments. Just 927 shares and 705 comments led to an incredible 1.4 million views (to date) on Facebook for an advert on the latest iPhone 7. Going for quality, this shows how effective a targeted demographic of followers can be at distributing content freely on social networks for a global brand such as Apple. Interestingly, there are only 577,899 views on YouTube, highlighting the differences between the two platforms and the way the competition for video play is heating up. Throwing the review rulebook out the window, Carphone Warehouse decided to do an unboxing of the Sony Xperia Z3 underwater, to try to prove how waterproof it is. This was published in 2014, and it’s still the most popular video on their YouTube. However, view counts do not necessarily indicate the popularity of content. Rather, the view counts simply indicate the length of time the video has been published, and if, like Carphone Warehouse, you’re reviewing the latest technology, it could be a potential problem with your content strategy.